Your consideration of St. Edward's University may begin with the basics: academic majors, study abroad opportunities, internships, and much more. As your interest grows, and the conversation goes deeper, you will likely inquire about the values and principles informing St. Edward's University's Mission. That's when you'll also likely learn about the Center for Ethics and Leadership. Get an update on their case. 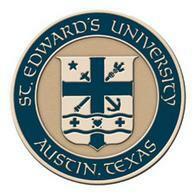 In the mid-1990s, St. Edward's University identified several initiatives that would define its future. One called for more experiential learning. The other reiterated that our Holy Cross and Catholic heritage, and a spoken commitment to the dignity of all individuals, should translate into a greater emphasis on ethics and leadership. The Center for Ethics and Leadership was established and continues to challenge students, faculty and staff to answer the important questions about ethics and leadership, such as how can our beliefs about morality lead to a life of human flourishing? Fusion Discussion Groups: These lunchtime discussions are open to students, faculty and staff to discuss diverse and distinct perspectives on important and relevant issues of our time. Speaker Series: Experts in fields of study associated with ethics and leadership are invited to campus to speak with students, faculty and staff to initiate a dialogue on topics of global interest. Deliberative Dialogues: These public dialogues focus on finding policy solutions to political problems by engaging in civic and civil discussions. The Most Reverend John McCarthy Lecture Series: These academic dialogues related to 21st century issues within the church underscore the university's commitment to its Catholic roots and Holy Cross heritage. The lectures are open to students, faculty, staff and the church community. The Center also provides support and training to faculty, students and staff to promote understanding and commitment to ethics and leadership (see our goals below). Additionally, the Center also initiates cooperative efforts to reach beyond our campus and support the development of ethical integrity and leadership in our communities. Jack Musselman, PhD, Director of the Center for Ethics and Leadership and Associate Professor of Philosophy (jackgm [at] stedwards.edu, 512-428-1026, Holy Cross Hall 208, Campus Mailbox 1033). See faculty profile here. Promote and nurture effective commitment to the common good based on a realistic understanding of the shared needs of all human beings. among students, faculty, staff, and administrators at St. Edward's. Foster a realistic basis for hope by focusing not just on the problems in our world and immediate communities, but upon positive examples of individuals, communities, and institutions which have facilitated the peaceful resolution of conflict and have responded effectively in morally exemplary ways to human needs. Teach and develop methods of ethical analysis which take into account human diversity, yet facilitate a rational consensus on the clear identification and just resolution of moral issues that includes - but is not limited to - personal and familial relationships, the workplace, educational institutions, healthcare, politics, the environment, and the appropriate development and use of technology. Be a resource for better understanding of the social and moral teachings of the Catholic Church. Stimulate and support research and pedagogical development in ethics education and applied ethics. Be a resource for personal reflection and foster a higher level of dialogue and contemplation about ethical issues faced by faculty, students, staff, and administrators as they fulfill their roles with the university and the community. Develop leadership and problem solving skills through curricular, co-curricular, and community activities in conjunction with careful inquiry into moral decision-making and the ethical implications of leadership. Develop honest, intelligent, and caring leaders. Promote an educational experience that integrates mission and community, theory and practice, values and applications. Consultations related to ethics and leadership are available upon request to university administrators, faculty, students, staff and members of the broader community off campus. For a list of publications from The Most Reverend John McCarthy Lecture Series, as well as publications related to ethics and leadership, click here. The Center for Ethics and Leadership's Ethics Advisory Board advise the Director of the Center on new initiatives and ongoing programming. The Holy Cross and Catholic heritage at St. Edward’s is a living tradition that seeks to inform and transform the lives of students. This living tradition provides a history and framework for the Center for Ethics and Leadership in its efforts to develop the intellectual, social, and spiritual lives of students, faculty, staff, and the community. Understand and live Christianity or those beliefs that give meaning and direction to their lives. Become informed and active citizens. Understand the importance of collaboration and community. Respect racial, religious, gender, political, cultural, and economic diversity. Participate in the life of a faith community and seek a dialogue between faith and knowledge, faith and culture, and faith and daily experience. Appreciate the need for a global perspective. St. Edward’s seeks to maintain that difficult balance of being both respectful of other faiths and affirming of our Catholic heritage. The Center has facilitated discussions and lectures on this topic through a series of faculty discussions and presentations with a grant from the Eli Lilly and Company Foundation. The search for balance is also reflected in university programming that invites a broad array of Catholic, as well as other religious and spiritual speakers. These diverse programs, along with many others on campus, promote the exploration of religious and spiritual inclinations.